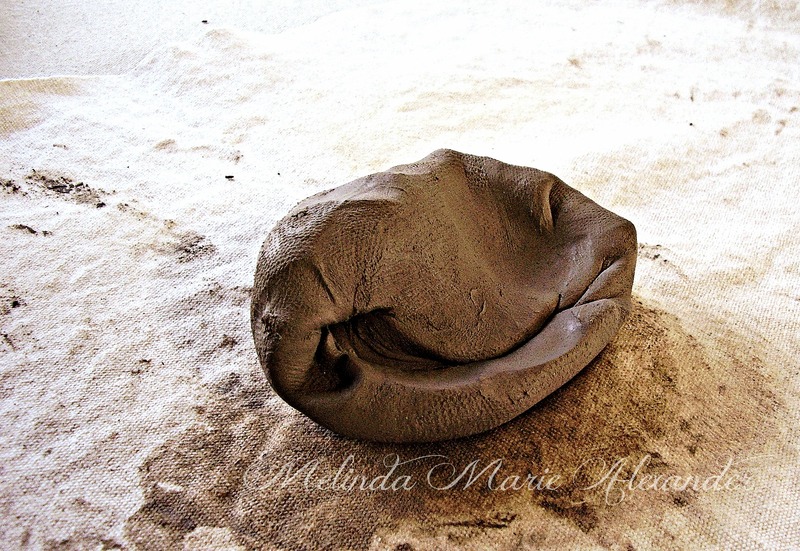 My rustic handmade dinnerware begins with a lump of stoneware clay. After wedging the clay, I place it on my slab roller and roll it into a large slab, then add texture. Once the texture is the way I like it, I cut out the pieces I need and form them into plates. 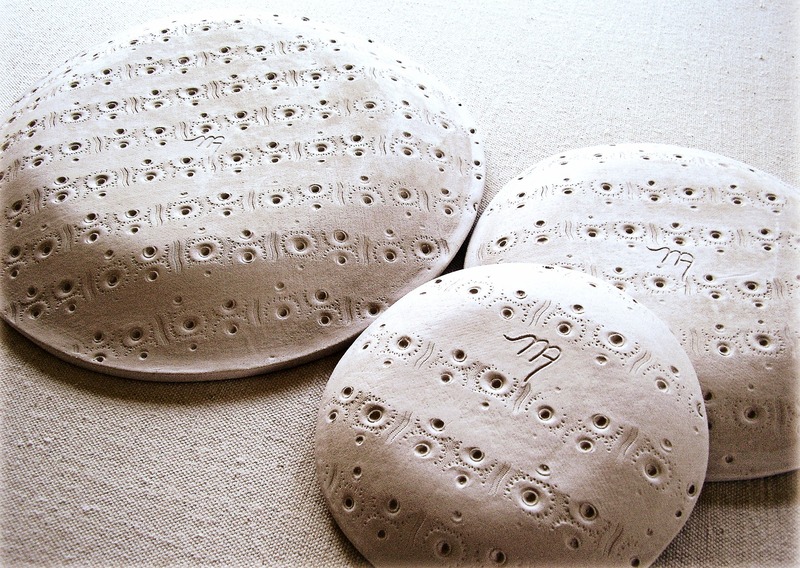 Once the plates are formed, I let them dry, just long enough to hold they’re shape. Then I clean them with my sponge, sign the bottoms and let them dry. This is the texture I use for this design. The first time I made these, my husband said, “It looks like the moon!” So, that’s how it got its name. 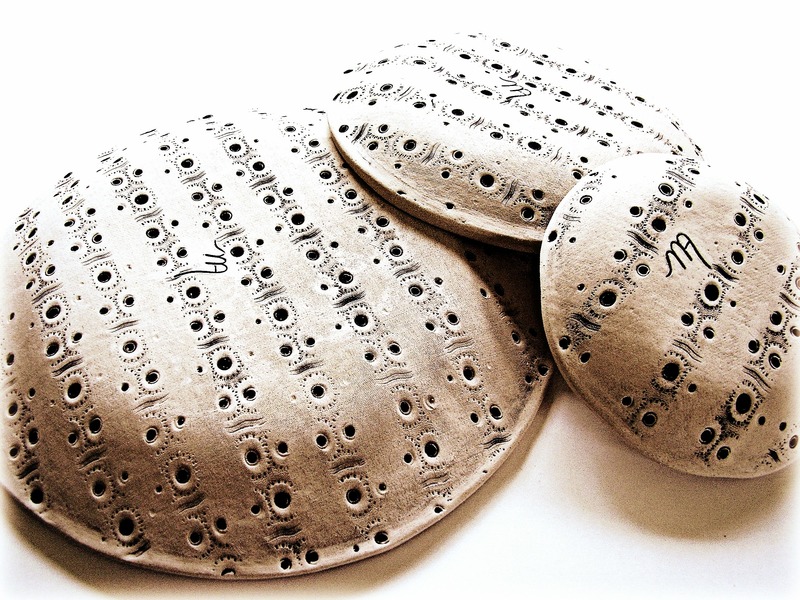 When they’re completely dry, I bisque fire them in my kiln. After they’ve been bisque fired, I brush on two coats of black underglaze on the bottom of the plates, then wash them off with a sponge leaving the black underglaze in all the holes and crevices, enhancing the texture. Then I glaze the surface of the plates with three coats of glaze and fire them in my electric kiln to cone 5. 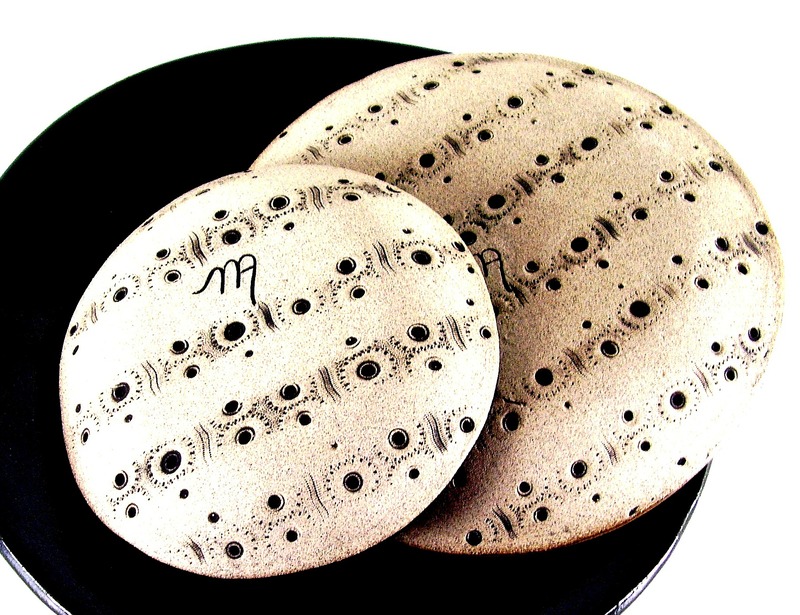 This is what they look like, after they come out of my kiln. 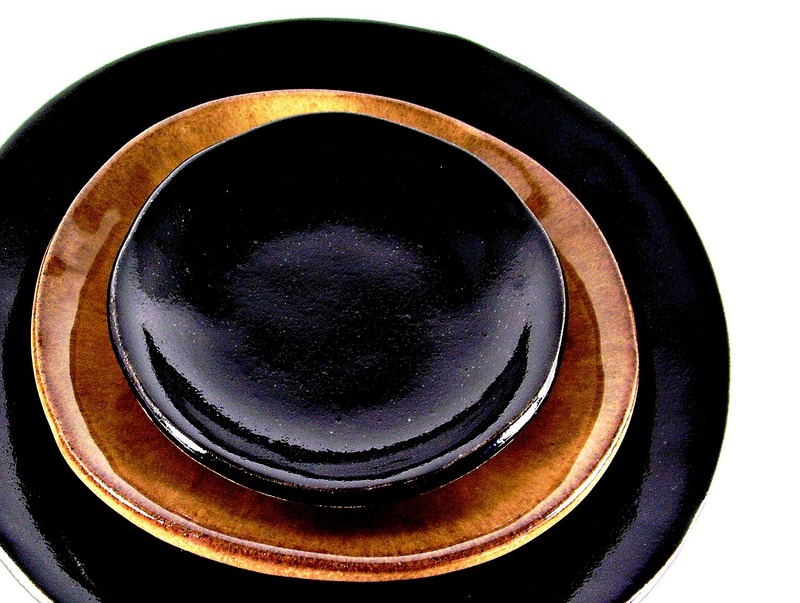 The dinner plate and bread and butter plate is called New Moon, and the side plate is called Moon Dust. The other colors available are Dark Side of the Moon, Full Moon, Harvest Moon, Moon Shadow and Once in a Blue Moon. And this is what the bottoms look like, after they are fired. Like little Moons! 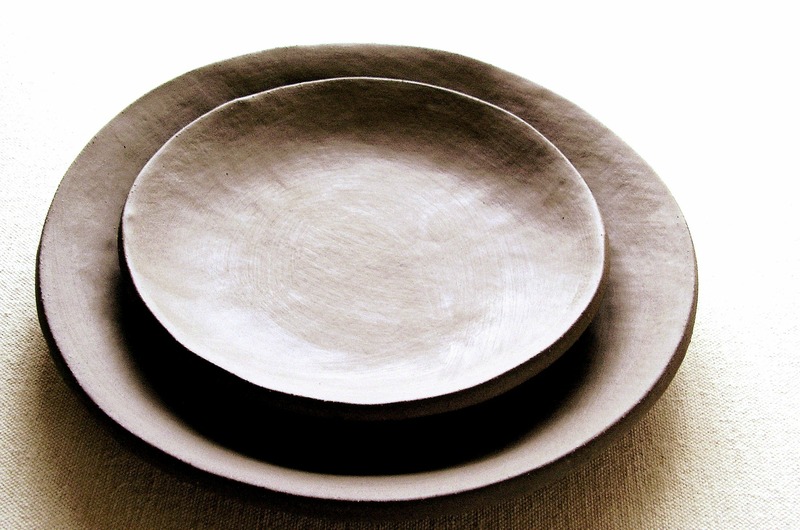 This entry was posted in Uncategorized and tagged ceramics, clay, color, handmade, handmade dinnerware, handmade plates, moon dust, new moon, plates, pottery, rustic dinnerware, stoneware plates, textured plates by ravenhillpottery. Bookmark the permalink. Wonderful! Congrats on your new blog! When you are back up and running I am very interested in purchasing some pottery from you please let me know when this happens.